The last thing I want to do on a Sunday is prepare an elaborate meal, unless there’s a special holiday coming up which is what I’ll be doing next week Sunday for Easter. During those times I don’t mind since I love the times spent with family but most of the time, I just want to chill out on a Sunday. Get up, walk the dog, make breakfast with some strong Bustelo coffee, watch the Sunday news and kick back. I might make plans to go into the city to check out an artsy or foodie event but if I stay in I want to make easy meals. Sometimes I’ll make large quantities so I can have some for dinner or lunch during the week and this is one of those dishes! The all too familiar spaghetti and meatballs but kicked up with a little heat and made with ground chicken…for an easy Sunday dinner. After you make your meatballs, refrigerate them since you’ll need to make your sauce next and it will need to simmer it for at least 30 minutes. OR you can start your sauce first and then make your meatballs while sauce is simmering. Basically you want the flavors to blend well together. Place the lid on while simmering. 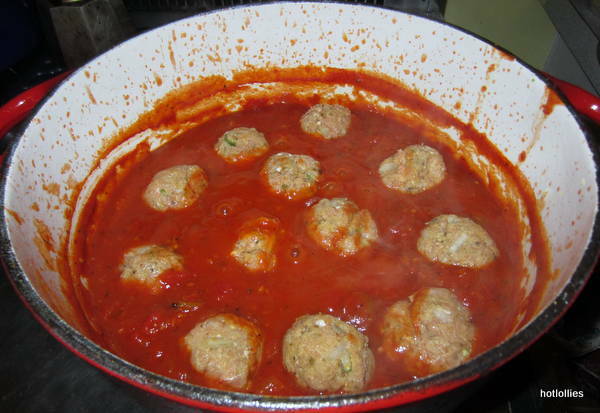 Place the meatballs into the sauce carefully, you don’t want them to break apart. Ladle the sauce over each meatball so they’re covered and cook for another 30 minutes. I always thought meatballs were so complicated but just look how simple it is. I’d say the most difficult part or laborious part, since it wasn’t difficult at all, was rolling each meatball…and really, who can’t do that? Serve it family style, with a salad, some crusty Italian bread, and a nice bottle of wine and just chill out and enjoy your Sunday evening. In a bowl add the ground chicken, onion, garlic, chile pepper, and bread crumbs and mix well. In a separate bowl beat the egg then add the salt, black pepper, cumin and turmeric and mix well. Add the egg mixture to the meat and mix well. Make the meatballs by spooning meat into hand and rolling. You should have about 12 golf ball sized meatballs. After you make the sauce and it has simmered for 30 minutes, add the meat balls to the spicy tomato sauce and simmer for another 30 minutes. Make spaghetti according to directions on the box, drain and spoon the meatballs over it. In a large pot (large enough to hold all meatballs), heat up oil on high heat. Add onion and let cook until translucent. Stir in jalapenos then add the tomato sauce and the diced tomatoes. Mix well then add the garlic, basil leaves, salt, sugar, and black pepper. 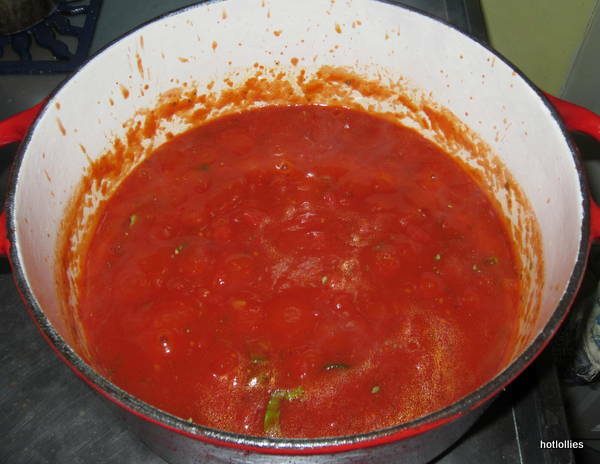 Turn heat down to low, cover pot and let sauce simmer on low heat for about 1/2 hour. You can make it spicier by adding extra jalapenos and serrano chiles but I really like this heat level, you can taste all the ingredients in the meatballs and the sauce. 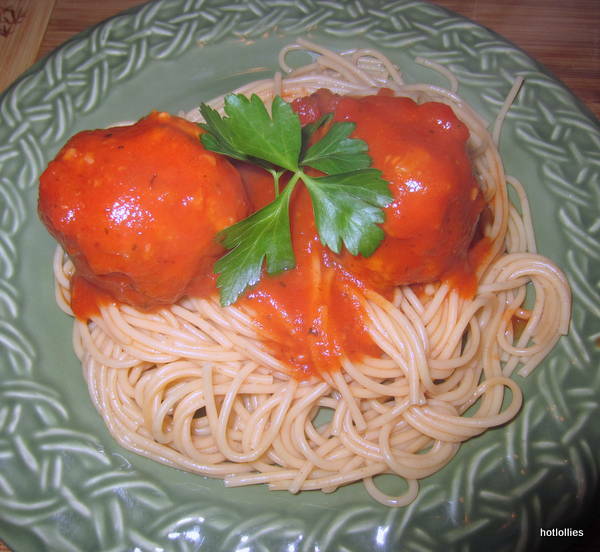 Serve with spaghetti or make meatball hoagies, either way its a great meal! This week I’m celebrating the Chinese New Year with food! I’m preparing a few of my favorite dishes, well at least the easier ones, kicked up a bit with spice! 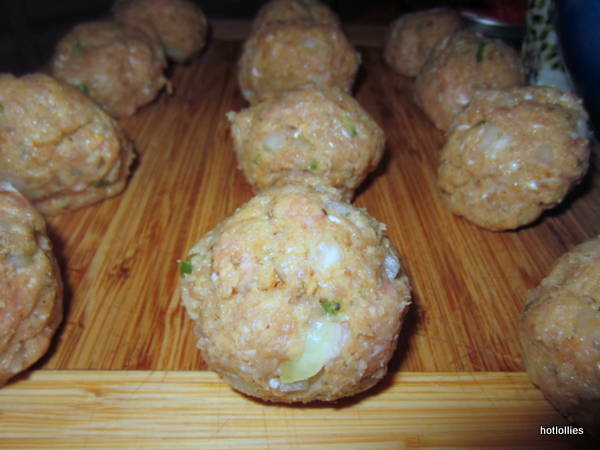 I’ve been looking for simple recipes for a while and found an Asian inspired meatball recipe and thought it would make a great wonton filling. The recipe called for turkey meatballs but I wanted to work with ground pork for my wontons so I omitted a few ingredients and added some spice. This meatball/filling is so incredibly good you can make anything with it. I can definitely see an Asian inspired burger in the near future! So even if you don’t celebrate Chinese New Year you can make this recipe your own and serve it for any gathering. 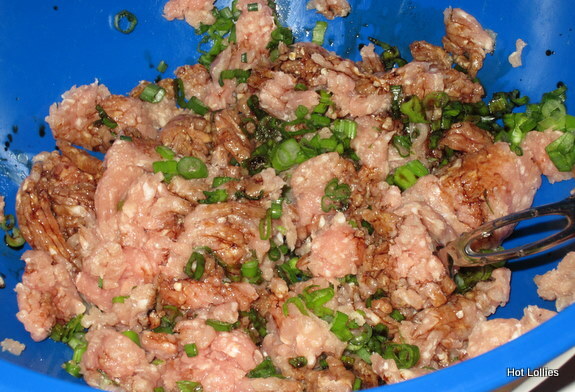 Here’s what I did…I chopped up a couple of scallions, added soy sauce, sesame oil, rice wine vinegar and hot chile peppers to ground pork and mixed it up really well. 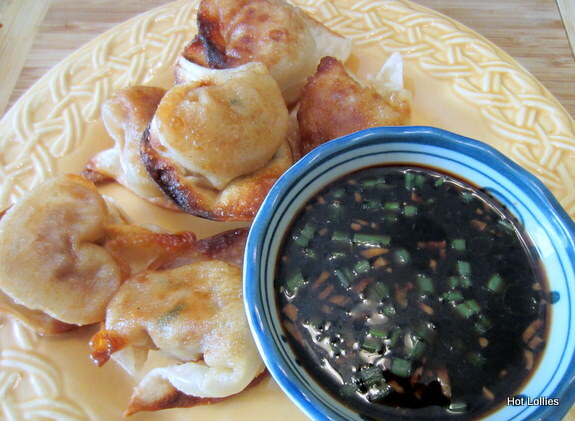 I then spooned about a tsp of meat into center of wrappers and shaped the wontons. The first couple I made were terrible but I got the hang of it once I got into my groove. This was actually fun and couldn’t wait to taste them. I felt like kid completing a really important project for school except I was going to do the grading! 1. Mix together the first 6 ingredients in a large bowl and blend well with fork. Cover and let sit in frig for at least 1 hour. 2. 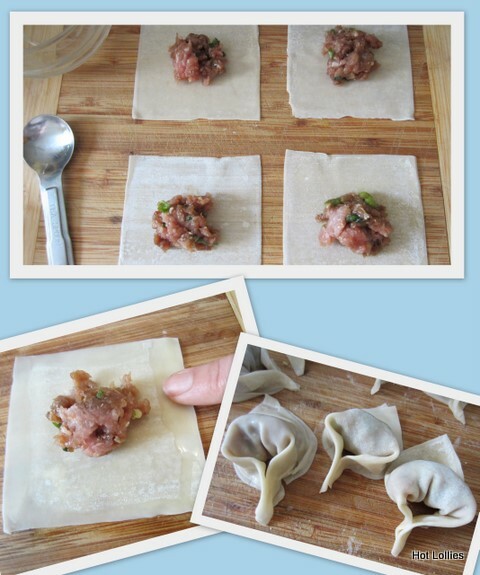 Line up your wonton wrappers on a board and spoon in 1 teaspoon of meat mixture in the center of wrapper. 3. Dab your finger in water and wet the edges of wrapper. Folder over wrapper to cover meat so you’ll be left with triangle shape. Grab each of the longer ends of triangle and bring together to form a little bonnet. Dab with a bit of water so the ends stick together. 4. Heat up oil in saute pan and add wonton wrappers when oil is hot. Do not let the oil smoke. Make sure its on medium heat and fry wrappers for 2 minutes on each side. Make these in small batches so its more manageable. Transfer cooked wrappers to paper towels to absorb oil and serve with dipping sauce. I only used half the batch to make wontons and decided to reserve enough for two burger patties that I froze, then I made these spicy little pork meatballs! This is a very versatile recipe and I’m sure you can think of many ways to have this so please enjoy!! 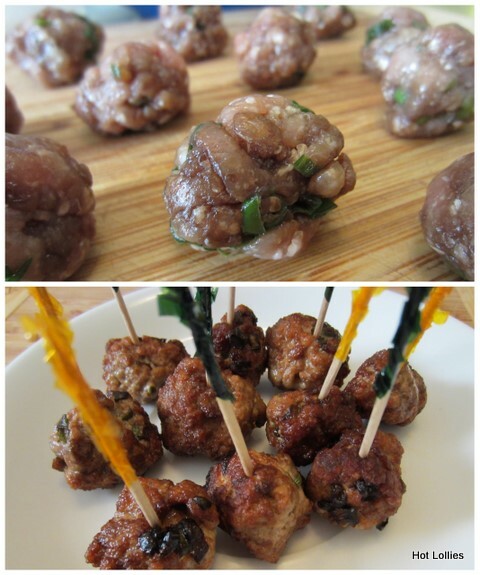 Just roll 1-2 tsp of meat between palms and fry mini meatballs in oil, enough oil to coat pan. Fry on medium heat for about 3 minutes making sure to fry on side first then the other. These are mouth-watering good! Definitely making these again for the Superbowl!! !